Large insects are pinned using number 3 pins which are inserted through the upper body surface. The pin is positioned at right angles to the body. Only a quarter of the pin's length should remain above the insect. pin through the front half of the right wing cover. pin through the base of the right wing on the right of the scutellum, the triangular shaped structure in the centre of the upper surface. pin through the centre of the thorax between the wings. The wings are displayed on both sides of the body. pin through the thorax to the right of centre. Pinning down the centre of the insect is usually avoided because you might destroy useful identification features. Inserting the pin off to one side may also destroy useful features, but they will still be visible on the other side. With dragonflies and damselfies (Order Odonata), move the front edges of the hind wings so that they are at right angles to the body; set the fore wings just a little in front of the hind wings. With bees, and wasps (Order Hymenoptera), the fore wings and hind wings are linked by a series of very small hooks; set them coupled together, so that the front edges are at right angles to the body. set wings with the front edges at 45° to the body. Use the same procedure as for butterflies, but move the hind wing so that it is at right angles to the body. Set the fore wings so that they are just a little in front of the hind wings. Set the large hind legs of grasshoppers in a jumping position, using pins to hold the leg. Specimens will take from one to three weeks to dry, depending on their size. Push the pin through the centre of the thorax and into the setting board until the underside of the wings rest on top of the board. Pin strips of tracing paper at the top edge of the board, one strip over each wing. Move the fore wing so the back edge it is at right angles to the body. Tuck the front edge of the hind wing under the fore wing leaving a small V.
With the wings in position, pull each paper strip tight and pin around the edges of the wing, not through them. The abdomen is supported with a V of pins. Small insects of house fly size or less are mounted on small pieces of card by pointing, carding or staging. Pointing is gluing the insect to the tip of a triangle of white card which is then mounted on a pin. Place a small amount of glue onto the point of the card and then touch this to the side of the insect. Carding uses rectangular pieces of card either 20X9 mm or 14X5 mm to provide a stage for the insect. Glue the insect to the middle of the card. This is the preferable method as the card protects the insect. 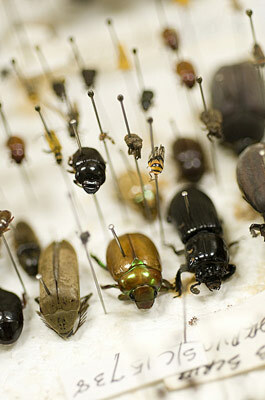 Staging involves pinning the insect with a very small headless pin called a minuten. The minuten is then mounted on a small piece of entomological foam pinned on a Number 3 pin. Left to right, examples of carding, pointing and staging.